Concert-News!! Michel Montecrossa’s ‘Mother Earth Cyberrock & Climate Change Concert’ will continue the ongoing ‘Courage & Love Climate Change Concert Tour’ on 7.03.2009 at the Michel Montecrossa Rock Vision Diner in Gauting near Munich. The concert by Michel Montecrossa and his band The Chosen Few starting at 10:00 p.m. goes along with an exhibition of Michel Montecrossa’s visionary paintings, drawings and Cyberart. The concert will be introduced at 9:00 p.m. by the orgiastic Rock-Music and Image World of Michel Montecrossa’s ‘Reality Rocker, Part I’ Movie– the breathtaking fusion of powerful images with powerful rock songs creating the intense experience-world of freedom and love, battle and conquest, hope and victory. on Saturday, the 7th, March 2009, from 9:00 p.m. – 1:00 a.m. Explore with this beautiful video by Mirakali – Mirakali Filmography – and great song ‘Cosmic Leap’ by Michel Montecrossa www.MichelMontecrossa.com the boundless range and convincing music-power of Michel Montecrossa’s work as Cybersymphony Composer. 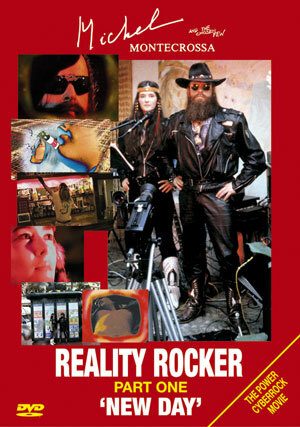 Das Video von Cyberage-Regisseurin Mirakali – Mirakali Filmography zu ‘Cosmic Leap’, eine Komposition von Michel Montecrossa www.MichelMontecrossa.com, kombiniert Michel Montecrossa’s tiefempfundene, hymnische Instrumentalkomposition mit einfühlsam-visionär gestalteten Bildabfolgen und ist ein weiteres ausdrucksstarkes Beispiel für Michel Montecrossa’a Schaffen als Cybersymphoniker. ‘Laughing’ – Michel Montecrossa’s presents 2nd amazing 2009 Concert on CD!!! 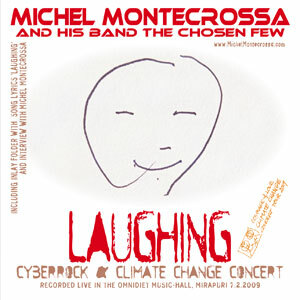 The ‘Laughing’ Cyberrock & Climate Change Concert, released by Mira Sound Germany as double Audio-CD and DVD is Michel Montecrossa’s second concert of the Courage & Love Climate Change Concert Tour 2009 presenting 27 songs, including the twelve string acoustic title song ‘Laughing‘, the climate change thrillers ‘Ways Of Change‘, ‘Climate Change Will Never Ever Stop!‘, ‘Laughin’ And Lovin’ – Anyway You Like‘ as well as the cybermetal ‘Adults Are Idiots‘. Mirakali and Diana Antara contributes climate change songs like ‘Sunshine‘ and ‘Paradiselight‘. 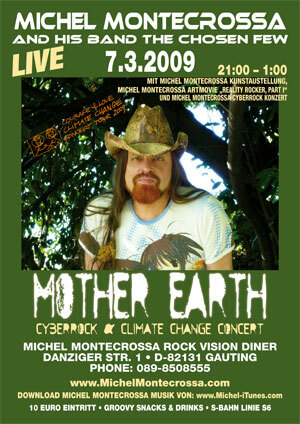 Michel Montecrossa’s ‘Laughing’ Cyberrock & Climate Change Concert ist ab jetzt bereits als CD erhältlich. Mit 27 neuen Powersongs, darunter Michel Montecrossa’s 12-String Guitar Masterpiece ‘Laughing‘ , dem Rockbeat & Cybermetal-Rausch seiner ‘Direct Talkin’ Songs ‘Climate Change Will Never Ever Stop!‘ und ‘Adults Are Idiots‘ sowie der unverkennbar, musikalisch-treffsicheren Handschrift der Cyberage-Songwriterinnen Mirakali und Diana Antara – ‘Sunshine‘ und ‘Paradiselight‘ – ist hier ein weiterer CD-Edelstein entstanden, der Musikfans in aller Welt direkt zur Party beamen wird!!!! Concert-News!! Michel Montecrossa’s fast-speeding, good-humoured ‘Courage & Love’ Cybermetal & Climate Change Concert will rock the Omnidiet Music-Hall (www.Omnidiet-Hotel.com) in Mirapuri-Coiromonte, near the Lake Maggiore, on 21.02.2009. The concert by Michel Montecrossa and his band The Chosen Few starting at 10:00 p.m. goes along with an exhibition of Michel Montecrossa’s visionary paintings, drawings and Cyberart. Hard-loving couples naturally also completely welcome!!! Michel Montecrossa mit Cybermetal Konzert am 21.02.2009 im Omnidiet Hotel!!!!! Highspeed-Action & Battle-Guitar FOR ALL WHO LIKE IT WILD beim ‘Courage & Love’ Cybermetal & Climate Change Concert von Michel Montecrossa and his band The Chosen Few – ein Cybermetal-Konzert mit Songs von Michel Montecrossa, Mirakali, Diana Antara und den Fabulous Sound Sisters. Space-Age Lover lassen sich natürlich auch nicht die gleichzeitig laufende Ausstellung von Michel Montecrossa’s visionären Gemälden, Zeichnungen und Cyberart entgehen!! Concert-News!! 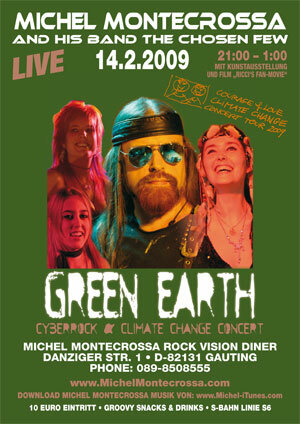 Michel Montecrossa’s ‘Green Earth Cyberrock & Climate Change Concert’ will continue the ongoing ‘Courage & Love Climate Change Concert Tour’ on 14.02.2009 at the Michel Montecrossa Rock Vision Diner in Gauting near Munich. The concert by Michel Montecrossa and his band The Chosen Few starting at 10:00 p.m. will be accompanied by an exhibition of Michel Montecrossa’s visionary paintings, drawings and Cyberart. The concert will be introduced at 9:00 p.m. by the film ‘Ricci’s Fan-Movie’. on Saturday, the 14. February 2009, from 9:00 p.m. – 1:00 a.m. Konzert-News!!! Michel Montecrossa’s ‘Courage & Love Climate Change Concert Tour’ wird am 14.02.2009 im Michel Montecrossa Rock Vision Diner in Gauting (Nähe München) mit dem ‘Green Earth Cyberrock & Climate Change Concert’ fortgesetzt werden. 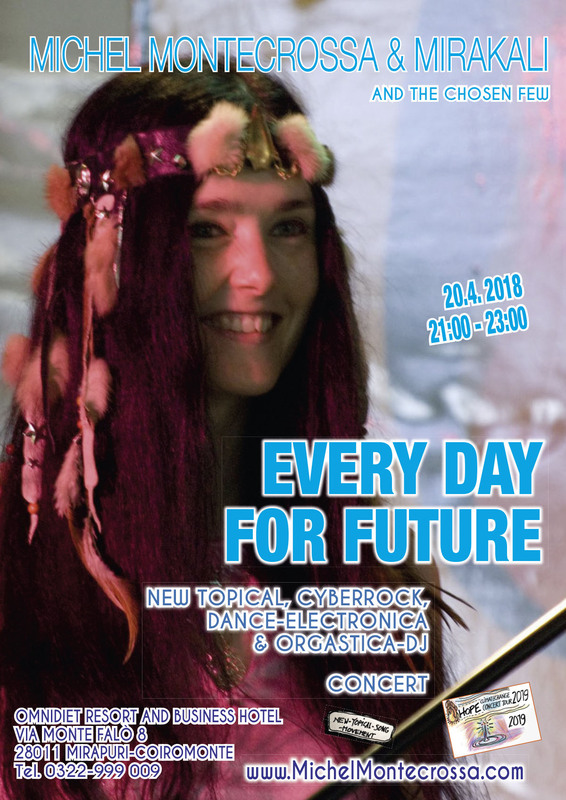 Das Konzert von Michel Montecrossa and his band The Chosen Few wird um 10:00 Uhr beginnen und wird von einer Ausstellung, die Michel Montecrossa’s visionären Gemälde, Zeichnungen und Cyberart präsentiert, begleitet werden. Das Konzert wird um 9:00 Uhr von einem Film-Intro eingeleitet; präsentiert wird ‘Ricci’s Fan-Movie’. Ein radikaler und alles umfassender Bewusstseinswandel führt zu einer ‘Grünen Erde’. LIVE INTERNET CONCERT OF MICHEL MONTECROSSA ON INAUGURATION DAY. A TRIBUTE TO OBAMA FROM THE CUSIO-REGION. PreAlpina ARMENO – (g.m.) 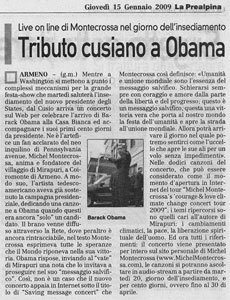 As Washington activates the complex mechanism of the big Fest-Show welcoming the Inauguration Day of the new President of the United States, an Internet-Concert is released from the Cusio-Region in Italy to celebrate the arrival of Barack Obama in the White House and to accompany the first hundred days of his presidency. It is created and performed by Michel Montecrossa, soul and founder of Mirapuri in Coiromonte-Armeno and declared supporter of the new resident in Pennsylvania Avenue. In his own unique way the German-American artist accompanied the election campaign of the president and dedicated a song to Obama (‘New President’) when he was “only” a candidate. The song was released all over the Internet and is still available there. In the song-lyrics Michel Montecrossa gives expression to the hopes of the world that go along with Obama’s victory. It is not by chance that the Internet Concert in accordance with Obama’s message “keep on moving with your saving message” is titled “Saving Message” and Michel Montecrossa explains: “Humanity and World-Unity are the saving message. It is a saving message and true victory to be always on the side of freedom and progress with courage and love.. It brings to our world the living celebration of humanity and opens the way to world-unity. Then the day comes when all barriers have fallen, within and around us and we can feel like the bird that opens its wings for an unopposed soar.” The 12 songs of the Internet Concert are the opening concert for Michel Montecrossa’s “Courage and Love Climate Change Concert Tour 2009”, presenting the themes that mean so much to the author from Mirapuri: Climate-change, peace and the spiritual freedom of humanity. Here are the links: the Internet Concert can be heard and seen on Michel Montecrossa’s website (www.MichelMontecrossa.com) as audio and video-streams for 100 days till 30th April 2009. Hier oben drüber könnt ihr jetzt die Übersetzung eines Artikels, der in der italienischen Zeitung ‘Prealpina’ erschienen ist, lesen, der sich mit Michel Montecrossa’s ‘Saving Message’ Internet Concert beschäftigt, das der Amtseinweihung sowie den ersten 100 Tagen der Präsidentschaft von Barack Obama gewidmet ist. Ich habe bis jetzt keine Übersetzung dieses Artikels ins Deutsche – also immer im Sprachtraining bleiben! !